Genetische Mechanismen der Adipositas sind komplex und umfassen das Zusammenspiel verschiedener genetischer Faktoren mit der Umwelt. Der Einfluss genetischer Faktoren wird dabei aktuell auf 40–70 % geschätzt. Es gibt jedoch auch verschiedene syndromale Adipositasformen, die sowohl monogen als auch oligogen auftreten können. Diese syndromalen Adipositasformen haben bisher maßgeblich zu unserem Verständnis molekularer Mechanismen des Energiehaushaltes und des Sättigungsverhaltens zur Kontrolle des Körpergewichts beigetragen. Es sind bisher mehr als 50 solcher Adipositas-Syndrome beschrieben. Meist bestehen weitere spezifische klinische Merkmale wie mentale Retardierung, Dysmorphien, Störungen endokriner Achsen oder organspezifische Entwicklungsstörungen, die oft ein typisches Präsentationsalter aufweisen. 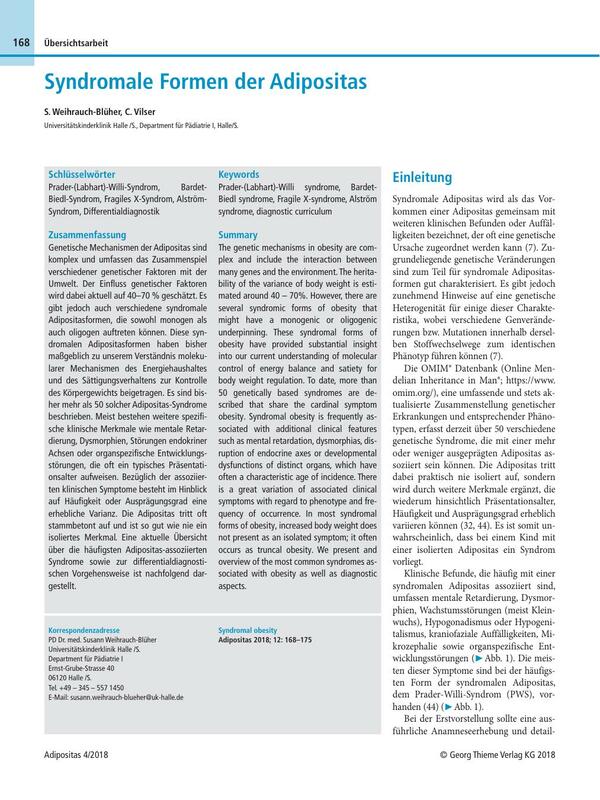 Bezüglich der assoziierten klinischen Symptome besteht im Hinblick auf Häufigkeit oder Ausprägungsgrad eine erhebliche Varianz. Die Adipositas tritt oft stammbetont auf und ist so gut wie nie ein isoliertes Merkmal. Eine aktuelle Übersicht über die häufigsten Adipositas-assoziierten Syndrome sowie zur differentialdiagnostischen Vorgehensweise ist nachfolgend dargestellt. The genetic mechanisms in obesity are complex and include the interaction between many genes and the environment. The heritability of the variance of body weight is estimated around 40 – 70%. However, there are several syndromic forms of obesity that might have a monogenic or oligogenic underpinning. These syndromal forms of obesity have provided substantial insight into our current understanding of molecular control of energy balance and satiety for body weight regulation. To date, more than 50 genetically based syndromes are described that share the cardinal symptom obesity. Syndromal obesity is frequently associated with additional clinical features such as mental retardation, dysmorphias, disruption of endocrine axes or developmental dysfunctions of distinct organs, which have often a characteristic age of incidence. There is a great variation of associated clinical symptoms with regard to phenotype and frequency of occurrence. In most syndromal forms of obesity, increased body weight does not present as an isolated symptom; it often occurs as truncal obesity. We present and overview of the most common syndromes associated with obesity as well as diagnostic aspects. 1 Albright F, Burnett C, Smith P, Parson W. Pseudohypoparathyroidism: an example of Seabright-Bantam syndrome. Endocrinol 1942; 30: 922-932. 2 Alstrom CH, Hallgren B, Nilsson LB, Asander H. Retinal degeneration combined with obesity, diabetes mellitus and neurogenous deafness: a specific syndrome (not hitherto described) distinct from the Laurence-Moon-Bardet-Biedl syndrome: a clinical, endocrinological and genetic examination based on a large pedigree. Acta Psychiatr Neurol Scand Suppl 1959; 129: 1-35. 3 Badano JL, Kim JC, Hoskins BE. et al. Heterozygous mutations in BBS1, BBS2 and BBS6 have a potential epistatic effect on Bardet-Biedl-patients with two mutations at a second BBS locus. Hum Mol Genet 2003; 12: 1651-1659. 4 Carpenter G. Case of acrocephaly with other congenital malformations. Proc Roy Soc Med 1909; 02: 199-201. 5 Carrel AL, Myers SE, Whitman BY, Eickhoff J, Allen DB. Long-term growth hormone therapy changes the natural history of body composition and motor function in children with Prader-Willi syndrome. J Clin Endocrinol Metab 2010; 95: 1131-1136. 6 Cassidy SB, Schwartz S, Miler JL, Driscoll DJ. Prader-Willi syndrome. Genet Med 2012; 14 (01) 10-26. 7 Chung WK. An overwiew of monogenic and syndromic obesities in humans. Pediatr Blood Cancer 2012; 58: 122-128. 8 Ciaccio C, Fontana L, Milani D. et al. Fragile X syndrome: a review of clinical and molecular diagnoses. Ital J Pediatr 2017; 43 (01) 39. 9 Claudia E, Dumitrescu Collins MT. McCune-Albright syndrome. Orphanet J Rare Dis 2008; 03: 1-12. 10 Cohen Jr MM, Hall BD, Smith DW, Graham CB, Lampert KJ. A new syndrome with hypotonia, obesity, mental deficiency, and facial, oral, ocular, and limb anomalies. J Pediatr 1973; 83: 280-284. 11 Douzgou S, Petersen MB. Clinical variability of genetic isolates of Cohen syndrome. Clin Genet 2011; 79: 501-506 Review. 12 Eiholzer U, Gisin R, Weinmann C, Kriemler S, Steinert H, Torresani T, Zachmann M, Prader A. Treatment with human growth hormone in patients with Prader-Labhart-Willi syndrome reduces body fat and increases muscle mass and physical performance. Eur J Pediatr 1998; 157 (05) 368-77. 13 Estrada A, Boyce AM, Brillante BA, Guthrie LC, Gafni RI, Collins MT. Long-term outcomes of letrozole treatment for precocious puberty in girls with McCune-Albright Syndrome. European J Endocrinol 2016; 175 (05) 477-483. 14 Forsythe E, Beales PL. Bardet-Biedl syndrome. Eur J Hum Genet 2013; Jan; 21 (01) 8-13. 15 Goldstone AP, Beales PL. Genetic obesity syndromes. Front Horm Res 2008; 36: 37-60 Review. 16 Hearn T, Renforth GL, Spalluto C, Hanley NA, Piper K, Brickwood S, White C. et al. Mutation of ALMS1, a large gene with a tandem repeat endocing 47 amino acids, causes Alstrom syndrome. Nature Genet 2002; 31: 79-83. 17 Holm VA CS, Butler MG, Hanchett JM, Greenswag LR, Whitman BY, Greenberg F. Prader-Willi syndrome: consensus diagnostic criteria. Pediatrics 1993; 91: 398-402. 18 Jenkins K, Seelow D, Jehee FS, Perlyn CA, Alonso LG, Bueno DF, Donnai D. et al. RAB23 mutations in Carpenter syndrome imply an unexpected role for hedgehog signaling in cranialsuture development and obesity. Am J Hum Genet 2007; 80: 1162-1170. 19 Kaplan G, Kung M, McClure M, Cronister A. Direct mutation analysis of 495 patients for fragile X carrier status/proband diagnosis. Am J Med Genet 1994; 51: 501-502. 20 Katsanis N, Badano JL, Eichers ER, Lewis RA, Hoskins BE, Scambler PJ, Davidson WS. et al. Triallelic inheritance in Bardet-Biedl syndrome, a Mendelian recessive disorder. Science 2001; 293: 2256-2259. 21 Kiess W, Körner A, Blüher S, Petzold S, Arelin M, Pfäffle R. Syndromale Adipositas. In: Kiess W, Hauner H, Wabitsch M, Reinehr Th. Hrsg. Das metabolische Syndrom im Kindes- und Jugendalter. Diagnose-Therapie-Prävention. München: Urban&Fischer, Elsevier GmbH; 2009: 139-150 ISBN 978–3–437–24560–2. 22 Kolehmainen J, Black GCM, Saarinen A, Chandler K, Clayton-Smith J, Traskelin A, Perveen R. et al. Cohen syndrome is caused by mutations in a novel gene, COH1, encoding a transmembrane protein with a presumed role in vesicle-mediated sorting and intracellular protein transport. Am J Hum Genet 2003; 72: 1359-1369. 23 Lee JS, Gibbon E, Butman JA, Dufresne CR, Kushner H, Wientrouble S. et al. Normal vision despite narrowing of the optic canal in fibrous dysplasia. N Engl J Med 2002; 347: 1670-6. 24 Limoge F, Faivre L, Gautier T, Petit JM, Gautier E, Masson D, Jego G. et al. Insulin response dysregulation explains abnormal fat storage and increased risk of diabetes mellitus type 2 in Cohen Syndrome. Hum Mol Genet 2015; 24: 6603-6613. 25 Marshall JD, Bronson RT, Collin GB, Nordstrom AD, Maffei P, Paisey RB, Carey C. et al. New Alstrom syndrome phenotypes based on the evaluation of 182 cases. Archive of Internal Medicine 2005; 165: 675-683. 26 Minton JA, Owen KR, Ricketts CJ, Crabtree N, Shaikh G, Ehtisham S, Porter JR, Carey C, Hodge D, Paisey R, Walker M, Barrett TG. Syndromic obesity and diabetes: changes in body composition with age and mutation analysis of ALMS1 in 12 United Kingdom kindreds with Alstrom syndrome. J Clin Endocrinol Metab 2006; 91: 3110-3116. 27 Mykytyn K, Mullins RF, Andrews M, Chiang AP, Swiderski RE, Yang B, Braun T. et al. Bardet-Biedl syndrome type 4 (BBS4)-null mice implicate Bbs4 in flagella formation but not global cilia assembly. Proc Natl Acad Sci U S A 2004; 101: 8664-8669. 28 Mykytyn K, Searby CC, Shastri M, Yen HJ, Beck JS, Braun T, Streb LM. et al. Identification of the gene (BBS1) most commonly involved in Bardet-Biedl syndrome, a complex human obesity syndrome. Nat Genet 2002; 31: 435-438. 29 Ohta T, Gray TA, Rogan PK, Buiting K, Gabriel JM, Saitoh S, Muralidhar B. et al. Imprinting-mutation mechanisms in Prader-Willi syndrome. Am J Hum Genet 1999; 64: 397-413. 30 Ong KK, Amin R, Dunger DB. Pseudohypoparathyroidism – another monogenic obesity syndrome. Clin Endocrinol (Oxf) 2000; 52: 389-391. 32 Pankau R. Syndromale Formen der Adipositas. In: Wabitsch M, Hebebrand J, Kiess W, Zwiauer K. Hrsg. Adipositas bei Kindern und Jugendlichen. Berlin, Heidelberg: Springer; 2005: 37-49 ISBN 3–540–01251–6. 33 Petrij F, Giles RH, Dauwerse HG, Saris JJ, Hennekam RC, Masuno M, Tommerup N. et al. Rubinstein-Taybi syndrome is caused by mutations in the transcriptional co-activator CBP. Nature 1995; 376: 348-351. 34 Prader A, Labhart A, Willi H. Ein Syndrom von Adipositas, Kleinwuchs, Kryptorchismus und Oligophrenie nach myatonieartigem Zustand im Neugeborenenalter. Schweiz Med Wschr 1956; 86: 1260-1261. 35 Rajaratnam A, Shergill J, Salcedo-Arellano M, Saldarriaga W, Duan X, Hagerman R. Fragile X syndrome and fragile X-associated disorders. F1000Res 2017; 06: 2112 doi: 10.12688/f1000research.11885.1. eCollection 2017. 36 Rauch F, Fahiminiya S, Majewski J, Carrot-Zhang J, Boudko S, Glorieux F, Mort JS. et al. Cole-Carpenter syndrome is caused by a heterozygous missense mutation in P4HB. Am J Hum Genet 2015; 96 (03) 425-31. 37 Rubinstein JH, Taybi H. Broad thumbs and toes and facial abnormalities. A possible mental retardation syndrome. Am J Dis Child 1963; 105: 588-608. 38 Ross AL, May-Simera H, Eichers ER, Kai M, Hill J, Jagger DJ. Disruption of Bardet-Biedl syndrome ciliary proteins pertubs planar cell polarity in vertebrates. Nat Genet 2005; 37: 1135-1140. 39 Salenave S, Boyce AM, Collins MT, Chanson P. Acromegaly and McCune-Albright-Syndrome. J Clin Endocrinol Metab 2014; 99 (06) 1955-1969. 40 Seifert W, Holder-Espinasse M, Spranger S, Hoeltzenbein M, Rossier E, Dollfus H. Mutional spectrum of COH1 and clinical heterogeneity in Cohen syndrome. J Med Genet 2006; 43: e22. 41 Seifert W, Kuehnisch J, Maritzen T, Horn D, Haucke V, Hennies HC. The Cohen syndrome-associated protein, COH1, is a novel, giant Golgi matrix protein required for Golgi integrity. J Biol Chem 2011; 286 (43) 37665-75. 42 Tauber M, Diene G, Molinas C. Sequelae of GH Treatment in Children with PWS. Pediatr Endocrinol Rev 2016; 14 (02) 138-146. 43 deVries TI, van Haelst MM. Cilia malfunction in obesity. J Pediatr Genetics 2014; 03: 79-88. 44 Wabitsch M, Kunze D. (federführend für die Arbeitsgemeinschaft Adipositas im Kindesalter (AGA) der Deutschen Adipositas-Gesellschaft: Konsensbasierte (S2) Leitlinie zur Diagnostik, Therapie und Prävention von Übergewicht und Adipositas im Kindes- und Jugendalter. Version 15.10.2015; www.a-g-a.de. 45 Weinstein LS, Yu S, Warner DR, Liu J. Endocrine Manifestations of stimulatory G protein alphasubunit mutations and the role of genomic imprinting. Endocr Rev 2001; 22: 675-705.